1. 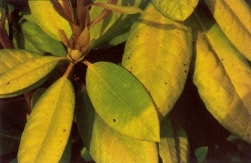 Sunburn – You will observe light yellow leaves, often with brownish burned areas, which will be on the sunny side of the plant. The under leaves, protected from the sun will be deeper green. Give the plant more shade or move it to a more protected site. 2. 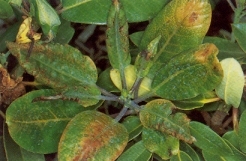 Windburn – There is often evidence of burn on the edges of leaves. 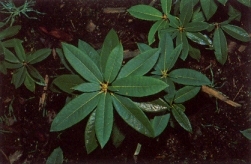 The plant generally has a “blown” appearance. Provide a wind break. 3. 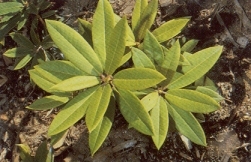 Fertilizer Burn – Burn is generally at the ends and edges of leaves and will be on any area of the whole plant, not just on the sunny side. Give as much water as possible to wash fertilizer out of roots. 4. 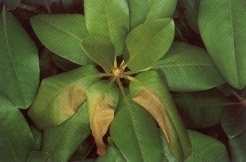 Chlorosis – This condition is character-ized by dark green leaf veins with yellow areas between them, often caused by lack of iron. However, it can also be shock-induced by damage to the roots from root rot, severe cutting of roots, root weevils or even root death due to an extreme amount of fertilizer. 5. 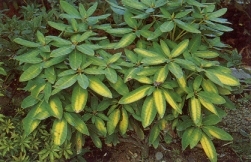 Light yellow leaves – Light leaf color is often just the need for more nitrogen. This will be more noticeable in the full sun. Some less sun tolerant varieties will always be light green in full sun. 6. 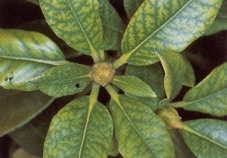 Frost burn on new growth – Even light freezing can damage cells as new growth is forming, causing the cells to develop improperly and make the leaf look deformed. Aphids wlll cause the same deformed appearance, as can high heat during critical cell development stage. 7. 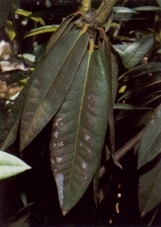 Freeze burn – Often there is a grayish appearance to burned areas in the leaf, or total browning, depending on the severity of the cold. (Photos below to left and center). 8. Barksplit – Damage due to subfreezing temperatures. This often happens in early fall freezes or late spring frosts, when the plant is not dormant. 9. 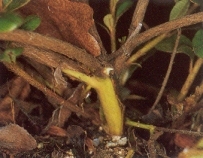 Natural response to below freezing temperatures – When temperatures are below 0Â°C (32°F), it is difficult for the plant to move moisture from its roots to its top. 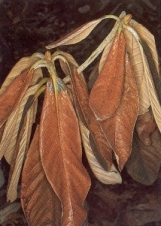 To prevent dessication, the leaves roll, exposing less surface to the cold. When temperatures warm to above freezing, the leaves return to normal. 10. 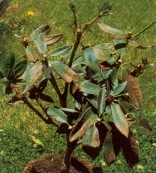 Insufficient water – An adequate amount of water is necessary for plant growth and flower development. In spring when it is still raining, we assume that the plants are getting sufficient water. This may not be true. This is a time when the plants use large amounts of water to develop flowers and new growth, and rainfall falling off of the “umbrella-like” foliage may not reach the roots. 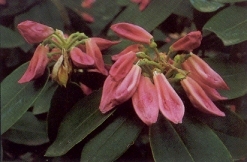 Flowers on a dry plant will sometimes start to open and then fall off without opening, as shown in the photo below at left. Other times the new foliage may wilt during the heat of the day, and even after being watered will show bum on the soft leaves, shown in right photo.